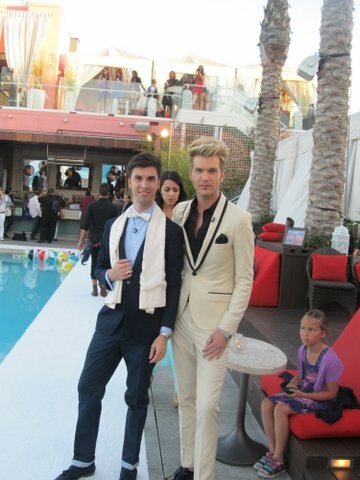 Mikey Koffman and The Gallery L.A. hosted the 2nd Annual Fashion Splash at the swanky Drai’s nightclub located in the W Hotel Hollywood. Last year’s event was so much fun, so I was excited to see what this year’s would bring. 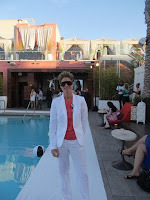 Held on the first day of summer at the rooftop lounge of the W it was the perfect evening for a poolside event. Upon my arrival I immediately spotted the handsome duo behind Skinny Executives: Alan McCune and Enrique Godoy Ynzenga. Alan and Enrique had the honors of curating the Fashion Show for the evening, which is just one of their many talents. Whatever your need may be Skinny Executives have you covered. Before the show guests were treated to mini manicures and complimentary hairstyling courtesy of Planet Salon. They also had the opportunity to visit the design suites, which included Zigi Shoes, Fazio Cleaners, and Rollasole. Rollasole shoes roll up so you can store them in your handbag and take them out when needed. They come in a variety of colors and if you happen to be in Vegas you can purchase them from a vending machine. The DJ from AMP Radio was in rare form and one had to take care not to dance to close to the edge of the pool. Allegro Winery hosted the bar and the signature Moscatini Allegro was delicious. 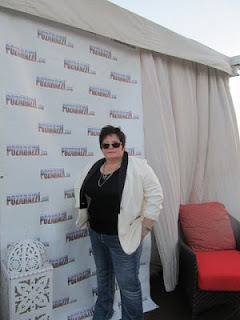 The event also celebrated the launch of Pozarazzi.com. I had to opportunity to chat with Jody Taylor the site’s CEO. She informed me that Pozarazzi would be the opposite of TMZ – exposing the positive aspects of celebrities as opposed to the negative. The site will be subscription based providing users with networking opportunities and will feature celebrity interviews and other interesting tidbits. I was so happy to see one of my favorite designer, the adorable Michael Kuluva. Michael looked fashionably chic in his Tumbler and Tipsy tee and amazing Chanel bag. Michael and I chatted about his new line Kuluva, the opening of his Los Angeles showroom, and a possible collaboration with a major retailer. It was nice to spend some one on one time with Michael. In addition to being a talented designer he’s really smart when it comes to business. 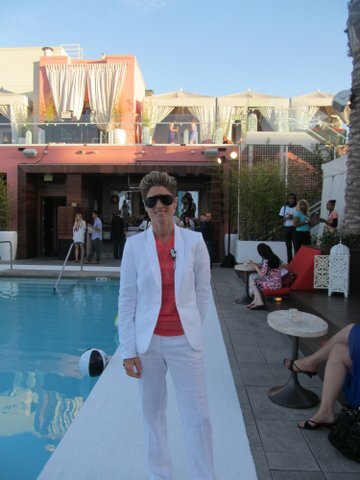 Mikey looked great with her new hairstyle and in honor of summer she was wearing a crisp linen suit. Before the presentations started she announced that LA Fashion Weekend will make its debut at Palm Springs Fashion Week this fall. Hope Reiners returned for a second year to dazzle us with her latest looks from Culture Swimwear. Mikey is always great about supporting brands that are committed to ethical and sustainable fair trade practices and Hope is no exception. Not only are her creations made entirely from recycled and vintage fabrics but she partnered with Keok’jay an organization that works to create jobs for women with HIV/AIDS in Cambodia to create her line of beautiful swimsuits. Her style evokes the strong free spirit and beauty of all women. Each piece made a bold statement as the models came down the poolside runway. Anthony Franco’s presentation consisted of a mixture of resort wear and tailored pieces. Anthony has a knack for turning unconventional prints into something stylish and chic. The night concluded with a special presentation by Sue Wong. Sue creates ornate, timeless pieces that are not only beautiful but also works of art. Tonight’s looks were inspired by The Great Gatsby and featured delicate hand beading and intricate embroidery. For the finale Sue sent out two gorgeous dresses that were adorned with cascading white feathers.